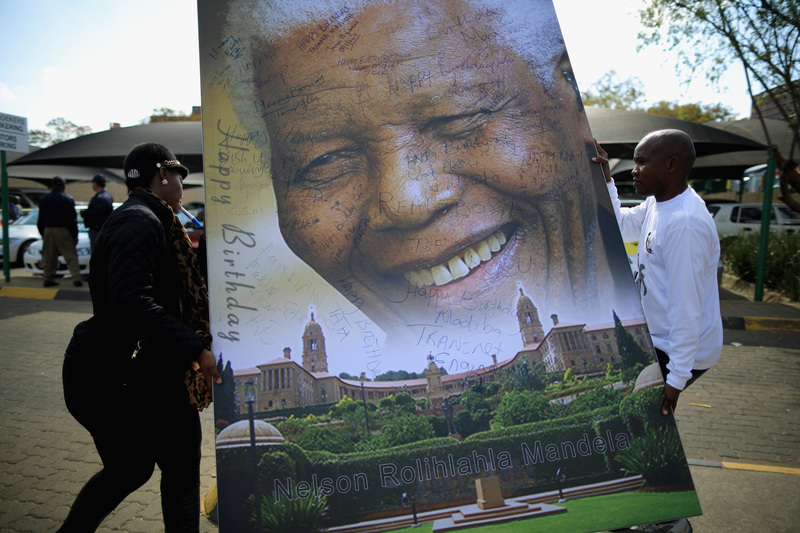 As celebrations ensue around the globe to mark the 95th birthday of Nelson Mandela, the much-loved leader is reportedly making a slow but steady return to health. Mandela was hospitalized with a lung infection 41 days ago, and South Africa feared for the worst when he was ultimately placed on a ventilator Now, according to his daughter, the worst has passed, and Mandela is expected to make it home. "I visited him today," current South African president Jacob Zuma told press. "I was able to say 'happy birthday,' and he was able to smile." Daughter Zindzi added that her father was making "remarkable progress," and that she couldn't wait to have him home. Today is UN-declared Nelson Mandela International Day, and global leaders have spoken out in honor of the leader. The South African population has been encouraged to spend 67 minutes volunteering for charitable causes (67 is the number of years Mandela has been in public service). In New York's Times Square, a huge Mandela painting by a South African artist is being featured. Virgin mogul Sir Richard Branson has pledged 67 minutes of community service today, and the Australian city of Melbourne is hosting a series of concerts this week in Mandela's honor. The UK has joined the party with, um, this.